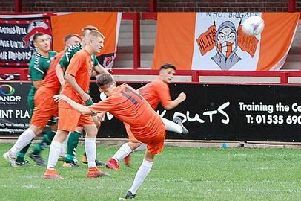 An acrobatic goal from 18-year-old striker Ben Bradley sealed victory for AFC on his full debut. A healthy crowd of 120 saw Bradley’s effort on the stroke of half-time lift the Mechanics up to third place in Hallmark Security League first division north. St Helens arrived unbeaten, while AFC had suffered their first defeat on Saturday in a game they dominated away to Steeton. Manager Dave Worthington made three changes to the side beaten at Keighley as Jack Taylor replaced Martin Baird at right-back and Mike Hall came in at left-back for Stephen Betteridge, who moved up to left wing in place of Carnan Dawson. The first half was fairly even, with few clear chances. 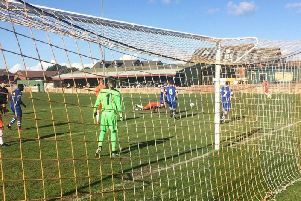 The deadlock was finally broken on 44 minutes, when an inswinging corner from the left was headed down by Danny Pickering into the path of Bradley, whose acrobatic shot went in off a Town defender. The second half saw the Saints storm forward as they desperately searched for the equaliser. But the AFC defence held firm as the hosts leapfrogged St Helens the visitors in the table after five games. Blackpool are two points behind Avro and Carlisle. Right winger Conah Bishop was the supporters’ man of the match for AFC, who are home to Daisy Hill on Saturday. Blackpool: Cameron, Taylor, Hall, Caunce, Mottram, Pickering, Bishop, Fishwick, Duffield, Bradley, Betteridge; subs; Broadstock, Williams, Baird, Dawson, Dickson.